View of “Simeon Barclay: They Don’t Like It Up ‘Em,” 2016. Artist Simeon Barclay’s current solo exhibition is his first in London. This multidisciplinary offering explores the subtleties of gender and memory through a diverse range of references derived from sports journalism, fashion, Afro-Caribbean culture, and British working-class history. The quietly embedded symbolism and cultural signposting within Barclay’s works—“semiotically charged” things, as the curator Morgan Quaintance notes—are gently highlighted by the artist’s clever use of various media. Sculpture, printmaking, video, and audio all coexist comfortably within the space, initiating a common language through a familiar set of associations. 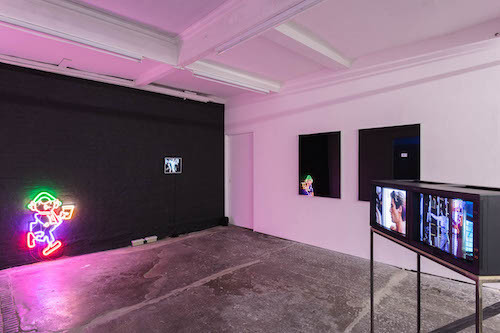 Coded references to power and gender fluidity via notable English pop-cultural figures, such as Princess Diana and the actress Maxine Peake, crop up, as does a nod to the cartoon character Andy Capp (Handicap, all works cited, 2016), rendered in strips of neon. Clips from Paul Schrader’s American Gigolo (1980) and Curtis Clark’s British Hustle (1978)—a documentary about Britain’s soul-disco scene, filmed inside the nightclub Clouds in London’s Brixton neighborhood—allude to the kinds of freedom that nightlife offers to anyone who feels burned by the drudgery of daylight and the nine-to-five life. The seductive materiality of Winner Takes All and The Physical Weight, with their polished aluminum surfaces, encourages one to consider the relationship between subjectivity and shared experience. By seeing our reflections in the work, we understand that individuality is a somewhat fraudulent concept, as we are so often shaped by the world and the unyielding streams of media bleeding out of it.